Jonah Kumalae gets contract to supply 250 ukulele per month, 1915. From the news heard from San Francisco, the stringed instrument, the ukulele, is greatly desired all over America because thousands of visitors at the exposition at San Francisco saw and heard for themselves the ukulele being played. Jonah Kumalae earlier had a contract to supply two hundred fifty ukulele a month to a company selling the musical instruments in San Francisco, but now the number has been increased to five hundred ukulele per month. J. C. K. Hopkins and his band travelling around America, 1914. From the left to right: Joe Kama; Peter Corney; J. C. K. Hopkins, the leader; the haole to whom belongs the movies; and Moses Kawaa. The picture above is of some Hawaiian boys travelling around some places in America, along with a movie company, using music to make a living in the unfamiliar lands. 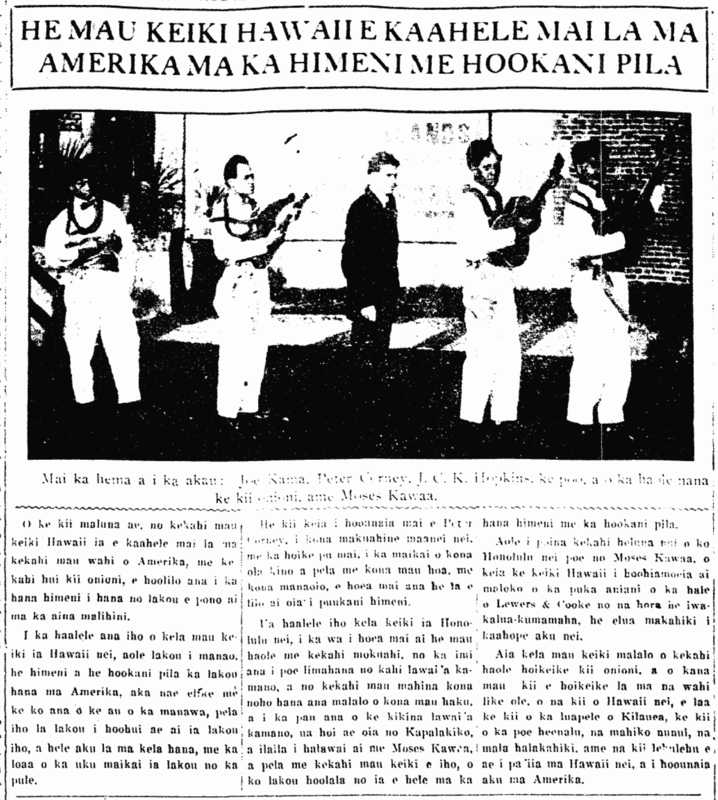 When the Hawaiian boys left Hawaii nei, they did not imagine that they would be singing and playing music in America, but with the passing of time, they found themselves getting together with each other and started this job, getting paid well by the week. This picture was sent by Peter Corney to his mother here and he also stated that he was in very good health as well as his friends, and that he believes that the day will come when he will become a singer. This boy left Honolulu nei when some haole came with a steamship in search of workers for a salmon fishing outfit and he spent several months working under his supervisors, and when the salmon fishing season was over, he returned to San Francisco and there he ran into Moses Kawaa and with some other boys, and they planned to go around singing and playing music. Many here in Honolulu have not forgotten Moses Kawaa, the Hawaiian boy who was made to sleep in the window of the Lewers & Cooke building for twenty-four hours, two years ago. These boys work under a haole who shows movies, and the movies that he shows all over the place are of scenes of Hawaii, like shots of the crater of Kilauea, shots of surfers, the expansive sugarcane plantations, pineapple fields, and many, many scenes taken in Hawaii nei and sent to America. Ka Nupepa Kuokoa, Buke LII, Helu 11, Aoao 5. Maraki 13, 1914. The Queen leaves Washington, D. C., 1900. We have received the latest news from San Francisco [Kapalakiko], about the arrival of the Queen and her travelling companions in that city on Sunday, May 19th from Washington. There are many friends who visit to see her, and the Hawaiian singing group living there came to honor their queen for two hours. Liliu is at the California Hotel with her companions, Joseph Heleluhe; Miss Myra Heleluhe; and Charles Hamilton English, her doctor. They are planning to return home on the Australia. That is what we hear from the Czarina. Ke Aloha Aina, Buke VI, Helu 22, Aoao 4. Iune 2, 1900. More on the California Midwinter International Exposition from Bila Kanealii, 1894. J. S. Keawe, one of our officers in the uplands of Kalihi writes that he received the news below about the Winter Exposition being held, from a letter of March 17th by Bill Kanealii from San Francisco: From amongst the new things at the Fair to be seen by the visitors, there is a huge wheel that is 180 feet tall with 18 boxes all around, with each box holding 10 people. Another is the tower with a very tall steeple 300 feet high. The lake is another thing of high esteem; it is stocked with all sorts of fish, with 100 pipes feeding water into the lake with all kinds of water, so many that the visitor would not be able to count them all. The merry-go-round [melekolauna] (a thing that spins), is a quarter mile long travelling around until reaching the place where it starts from. The Hawaii display is the best of all. There are two days that the proceeds are the highest, that being Saturdays and Sundays, where $1,000 or more is the most and $500 or more is the least. Ka Makaainana, Buke I—-Ano Hou, Helu 14, Aoao 3. Aperila 2, 1894. 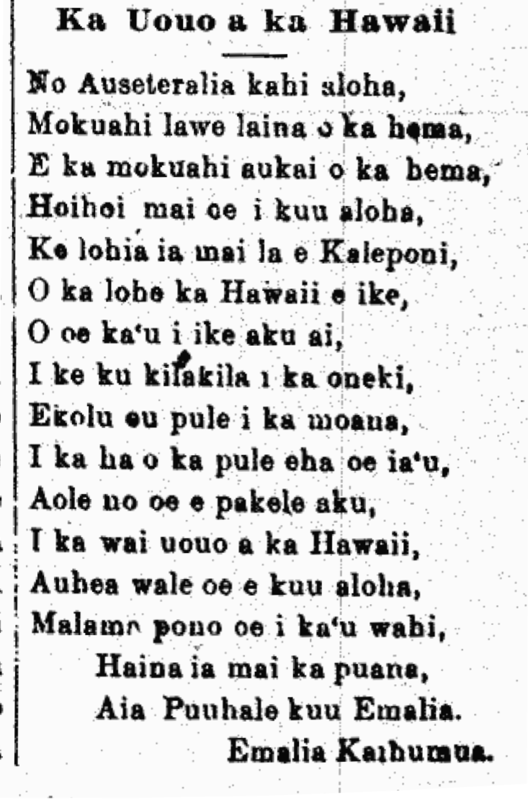 Another mele by Emalia Kaihumua, 1894. Aia i Puuhale kuu Emalia. Ka Makaainana, Buke I—-Ano Hou, Helu 2, Aoao 3. Ianuari 8, 1894. Probably the earliest known version of a song well known today, 1894. 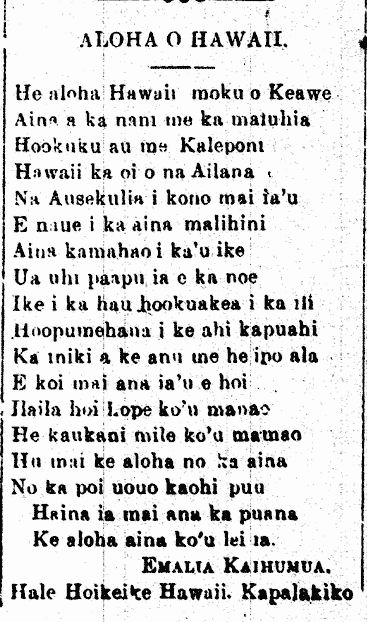 Ka Leo o ka Lahui, Buke II, Helu 929, Aoao 3. Aperila 27, 1894.